DINGLE GAA’S most decorated player got the shock of his life on Saturday night when he walked in the door of his pub on Sráid Eoin to be met with rapturous applause. 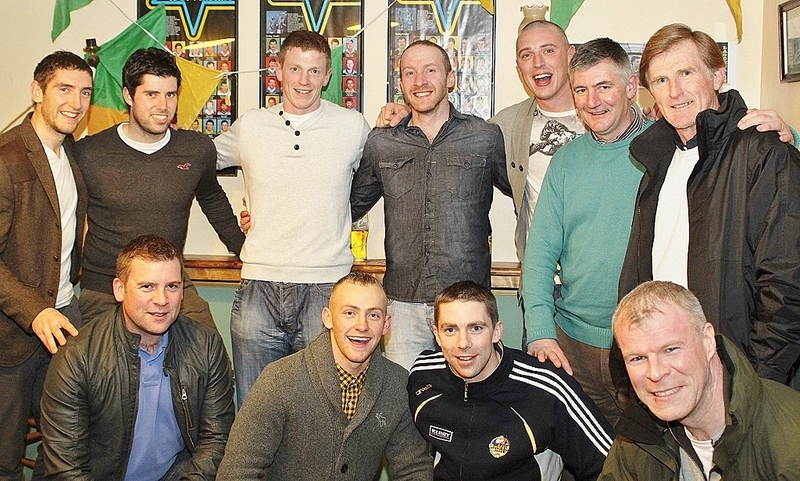 Close friends and family had been plotting the the celebration for recently retired Kerry star Tommy Griffin for weeks. And, even though it’s virtually impossible to keep a secret in Dingle, Padraic Corcoran and Co. managed to keep the surprise event under wraps until Tommy walked in the door of Muiris Dan’s last Saturday night shortly after 10pm. Team-mates, classmates, friends, family and well-wishers had quietly crammed into the pub earlier in the evening while Tommy travelled to Tralee to support Kerry as they took on Armagh in the National League. As he entered the pub the place exploded; poor Tommy getting the fright of his life. Páidí Ó Se was among those to pay tribute to Tommy at the event; describing his retirement as a loss to Kerry football. Dingle PP Canon Tom Looney was also present – the resident GAA expert waxing lyrical about Tommy’s contribution to his county’s fortunes over the years. Newly appointed Dingle GAA Chairman Mícheál Ó Conchúir also spoke of the incomparable efforts put in by Tommy – who holds five All-ireland medals – on behalf of his club, from the underage ranks right up to senior level. He touched also on the inspiring role he has played. “Tommy is the most decorated player in the history of Dingle GAA,” Mícheál noted. “All past, present and future players will be measured against him. It is fitting that this tribute has been paid to him as often perhaps he didn’t get the credit he deserved,” added Mícheál, also put into context the crucial role Tommy played with the Kerry panel and how his efforts turned the fortune of many games. “Tommy was one of Kerry’s most crucial p layers and it is appropriate that we pay tribute to him in this way,” Mícheál added. “As an unsung hero, he wasn’t in the limelight as much as other players but his contribution cannot be underestimated. Mícheál also spoke of Tommy’s massive collection of honours; from the underage ranks with Dingle right up to intercounty football with the Kerry minors, Under-21s, Juniors and ultimately as a key member of the Kerry panel over the past decade. The Dingle’s GAA faithful turned out in force to celebrate Tommy’s football career in Muiris Dan’s, along with a group of Kerry stars past and present, including Dara Ó Cinneide, Kieran Donaghy, Barry-john Keane, Killian Young, Tomás Mac an tsaoir, David Geaney, Diarmuid Murphy, Páidí Ó Se, Vincent O’connor and Bernard O’Sullivan. Tommy’s family and friends, including his fiancee Julie, friend Padraic and Padraic’s wife Anna, also presented him with some Dingle crystal in recognition of his many achievements on the pitch. Pictured, from left: Back, from left, Kerry GAA stars Killian Young, David Geaney, Tomás Mac an tSaoir, Tommy Griffin, Kieran Donaghy, Bernard O’Sullivan and Vincent O’Connor. Front, from left, Dara Ó Cinnéide, Barry John Keane, Marc Ó Sé and Diarmuid Murphy celebrating at Tommy Griffin’s surprise party in Muiris Dans, Dingle.